Flying to Malaysian Borneo from Peninsular Malaysia was stunning. The views of the sparkling blue sea and the greenness of the island were an inspiring welcome to this laid back island, divided into the three countries of Malaysia, Indonesia and Brunei. The island is very green and as far as the eye can see are the sprawling palm oil plantations which have posed such a threat to the wildlife that calls Borneo home. Beyond that however is the straggling jungle, so beautiful especially in the early morning light. On my first night I stayed in a long house in the jungle where I could hear the macaques chattering away in the trees and see the stars like I have never seen them before. I awoke early in the morning to go for a walk around the lakes just outside of the guest house and saw flowering lilies on lily pads as far as the eye could see. I couldn’t wait to get to the project point to get stuck in! The drive from the volunteer guest house to the Orang Sungai (meaning People of the River) village took just under 2 hours. Seeing the river and the hustle and bustle surrounding it was amazing. 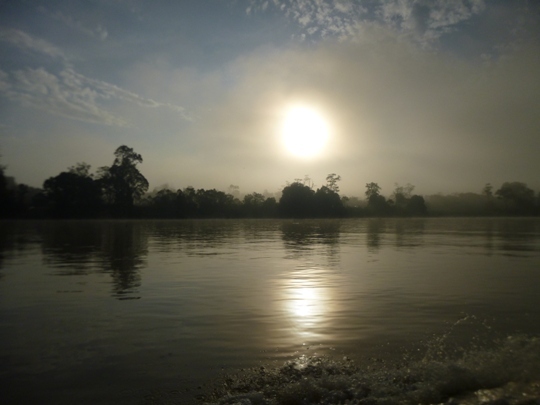 Lining the river were straggling villages and vast expanses of rainforest. It was beautiful. Getting out on the boat in the afternoon was amazing. Whilst I love nature and animals, I can’t claim to be particularly strong on naming wild birds, but by the end of 2 hours I had seen birds that I had never heard of and with such amazing colours and beaks that I just wanted to see more. We spent 2 hours out on the river monitoring the wildlife and logging the sightings that we had. Even now I can remember the excitement of seeing proboscis monkeys (if you don’t know what these are- google them! They are so funny) chasing each other through the trees, a mother langur carrying her baby along a branch and the macacques bedding down for the night. In addition to that, we saw a mother orangutan and her baby gently feeding in the upper boughs of a tree- a sight I honestly feel so lucky to have witnessed. Orangutans in their natural habitat are so rare that this felt like a once in a lifetime experience. If those sightings weren’t enough, we even saw a crocodile basking in the sun. The only creatures I missed were the elusive pygmy elephants, but we certainly heard them calling to each other in the depths of the forest! In the evening we walked to the house of a local Orang Sungai family. Here we were welcomed with open arms and introduced to “Auntie”, the woman of the house. She prepared an incredible feast of a dinner for us with beef, chicken, prawn, vegetables and lots of rice. The food was so delicious that I couldn’t stop going back for more! A sweet water melon rounded off our supper. We spent the evening laughing and joking and learning some Malaysian so that we could thank Auntie and compliment her cooking. It was lovely to be welcomed into a local family and to experience life in a tribal home on the banks of the Kinabatangan River. The following morning was an early start- but totally worth it! I awoke shortly before 6am and walked down to the river where I saw the mist lifting off the water as the sun came up. The colours were absolutely beautiful and it felt like I was the only person there (despite the other volunteers coming down for breakfast and a cuppa!). Not long after we headed out on the boat to the tree planting site, where we would be clearing weeds to help saplings to grow. Whilst the work was tiring and hot (I was considering advertising this trip as a weight loss programme!) it was incredibly rewarding. At the beginning of our session we were confronted with a weedy green undergrowth- by the end the trees were clear of weeds and creepers and able to grow up tall. In just a few hours we had cleared enough space to allow the rainforest to start to regenerate itself. It was very humbling. Volunteers who come here spend 12 days helping with regeneration and monitoring the wildlife. It is an amazing project and one that I just want to go back to almost every day! Sitting in the boat and witnessing wildlife felt more like relaxation than work, but all that we were doing was going to an important research and protection project. Tree planting and clearing was certainly harder, but knowing that the baby orangutan and her mother could in the future swing through that patch of forest that we had worked on made it all worthwhile. To find out more about this conservation project, see our volunteering in Borneo webpage. Previous Post Why are coral reefs so important?